One Savvy Mom ™ | NYC Area Mom Blog: Umi Sport ~ Because Little Feet Need A Little Love! 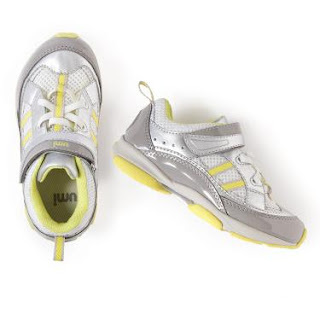 Umi Sport ~ Because Little Feet Need A Little Love! Having already had several great experiences with Umi, I was more than thrilled when they announced their new Sport line of shoes for children. 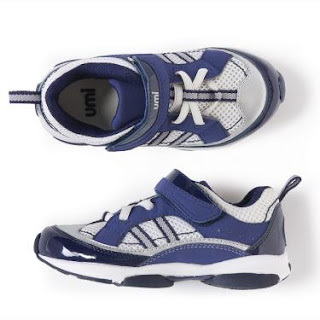 When shopping for children's shoes there are two main criteria that I look for 1.Lightweight construction (added weight on little ankles is a no-no) 2. A reasonably wide toe-box. Umi has not only met those criteria, they've taken it one step further. Umi has included an antibacterial foot-bed and designed this adorable new line to be washing machine friendly! Yep, that's right! Machine Washable! With two kids that are super rough on their sneakers, I did a little jig when I heard that! You can either remove the anti-bacterial insert and wash it individually or simply pop the sneakers in the washing machine and leave them out to air-dry. . While I've certainly washed my childrens shoes in the past, I'm generally less than thrilled with their appearance after a few trips through the machine. Even though these sneakers were brand new, I sent them through the washing machine last night to see how they would hold up; and they passed with flying colors! They didn't lose shape at all and they look just as great as they did when I pulled them from their packaging. With fashionable colors and designs + kid friendly (and mom friendly) features Umi has definitely exceeded my expectations once again. 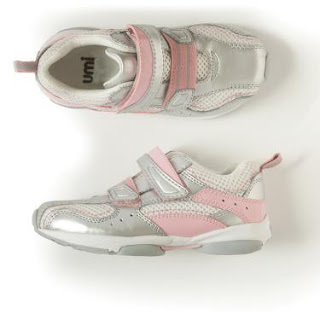 The Umi Sport Line of Childrens sneakers offer a sleek European Style and are available for both boys & Girls. With light weight construction for making tracks in serious comfort. Removable, machine washable anti-bacterial foot-bed keeps feet fresh. Play, wash, repeat! When it comes to little feet, Umi is the best!